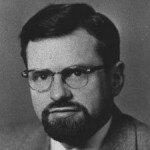 Dr. Josef Allen Hynek was born in Chicago, Illinois, USA. He was an American Astrophysicist, professor and ufologist. He is perhaps best remembered for his UFO research. He acted as scientific advisor to UFO studies undertaken by the U.S. Air Force under three consecutive projects: Project Sign, Project Grudge, and Project Blue Book. In 1931, he received a B.S. degree from the University of Chicago. In 1935, he completed his Ph.D. in astrophysics at Yerkes Observatory. He joined the Department of Physics and Astronomy at Ohio State University in 1936. During World War II, he was a civilian scientist at the Johns Hopkins Applied Physics Laboratory, where he helped to develop the United States Navy's radio proximity fuze. He served as a professor and chairman of the astronomy department at Northwestern University in 1960. He wrote several books include: The UFO Experience, The Edge of reality, The Hynek UFO report, and Night siege.